The Department of Intellectual and cultural Affairs announces the success of its media plan to perform the Ziyarat Arba'een and confirms that dozens of satellite channels have benefited from its satellite broadcast. The Department of Intellectual and cultural Affairs at the al-Abbas's (p) holy shrine announced the success of its media plan, which was prepared for the Ziyarat Arba'een, in which it facilitated the task for more than 240 media channels that participated in the transfer of these events and rituals. The Deputy Head of Intellectual and Cultural Affairs at the al-Abbas's (p) Holy Shrine; Sayed 'Aqeel Abd al-Hussayn al-Yassiri has announced: "Prior to the Ziyarat, a series of meetings were held with the media divisions to discuss the broadcast and archiving the Ziyarat Arba'een. These meetings results in an integrated media plan commensurate with this important international event." Indicating: "Al-Kafeel Center for artistic production and direct broadcast has played an active and direct role in this plan, as it has provided free live broadcast to cover the rituals of the Ziyarat Arba'een following a broadcast program including the march of Arba'een from the farthest point until Karbala, the condolences rituals in the two holy shrines and the condolence processions. Dozens of satellite channels from inside and outside Iraq have benefited from this service, exceeding the number of channels using this service last year, as a result of the accumulated experience of the Center's staff in the live broadcast, from the cameramen and directors, who used the center's sophisticated equipment. All the combined efforts led to the broadcast of an image with the standards required by the satellite channels. 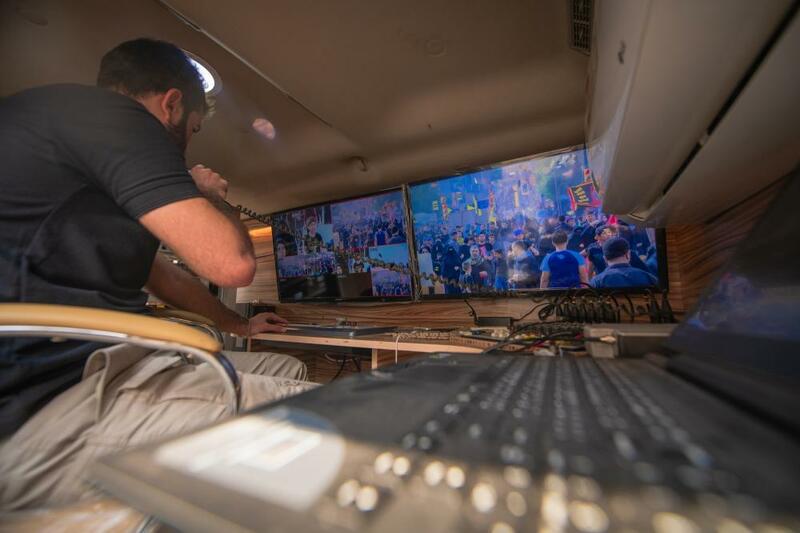 Therefore, the clean, free and open broadcast has attracted the demand of many satellite channels that wanted the broadcast of the rituals of such Ziyarat, in which millions of visitors take part." Al-Yasiri continued: "In the audio field, al-Kafeel women radio has an eminent role to cover the Ziyarat, with a Hussayni spirit, its staff worked hard for the coverage of the importance and impact of this Ziyarat. On the other hand, thousands of Al-Kafeel and Khamis newspapers were distributed free of charge to the visitors, to entrench the principle of Arba'een. In addition to the great role of the Al-Kafeel Global Network, the official website of the al-Abbas's (p) holy shrine, which has dedicated all of its articles to cover the march of Arba'een, the activities and services of the various departments of the al-Abbas's (p) holy shrine, as well as publishing many scenes, videos and pictures taken by the media team within the media project "with their eyes", which includes a number of journalist and media professionals from all over the world."